The Amalekites fight against the Israelites led by Joshua, with Moses pictured in the background on a hilltop. The Amalekites were a biblical people and enemy of the Israelites. They were reportedly wiped out almost entirely as the result of Israelite victories against them in wars beginning shortly after the Exodus and continuing into the period of the early Israelite monarchy. Amalekite settlements are reported in the biblical record as late as the reign of King Hezekiah in the eighth century B.C.E., and the Book of Esther portrays its later villain, Haman, as a descendant of an Amalekite prince. The Amalekites are unknown historically and archaeologically outside of the Bible except for traditions which themselves apparently rely on biblical accounts. In the Bible, the Amalekites are said to have descended from a common ancestor named Amalek, a grandson of Esau. In this sense they may be considered as one of the Edomite tribes. Jewish tradition sees the Amalekites as an implacable enemy of both God and Israel. 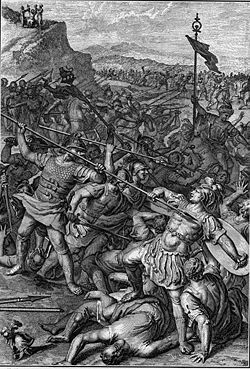 The first reference to the Amalekites is found in Genesis 14, which describes a military campaign of Kedorlaomer, king of Elam, and his allies which took place in Abraham's day before the birth of Isaac. Kedorlaomer conquered territories of the Amalekites, the Horites of Seir, Amorites, and others. On the other hand, Genesis 36:12 describes the birth of Amalek himself as Esau's grandson, born four generations after the events of Kedorlaomer's time. This account makes the Amalekites one of the Edomite tribes, descended from Esau's firstborn son, Eliphaz. Amalek's mother was named Timna, a Horite princess descended from Seir, for whom Edom's Mount Seir was named. The Amalekites do not appear again until 400 years later, when Moses is leading the Israelites toward Canaan from Egypt. At Rephidim, the Amalekites suddenly appear and attack the Israelites, who are apparently trespassing on their territory. Moses commissions the young Joshua to act as general for the Israelites. Moses climbs a nearby hill to watch the battle, and a see-saw battle ensues, with the Amalekites prevailing whenever Moses lowers his arms and the Israelites prevailing whenever he raises them. Aaron and Hur help the aging Moses hold his arms high, and Joshua's forces eventually prove victorious. Map shows the extent of Edomite territory, in which the Amalekites may have operated. The prophet Samuel kills King Agag of the Amalekites. The destruction of the Amalekites, however, is not as complete as it seems. The future king David encounters them later in Saul's reign when David is serving the Philistine King Achish, having been declared an outlaw by Saul. As a Philistine vassal, David conducts raids against the Amalekite towns, killing all their inhabitants but sharing the plunder with Achish. While David is on campaign with Achish, the Amalekites retaliate against him by raiding and burning his town of Ziklag and taking his property, including his wives, Ahinoam and Abigail. David meets a wounded Egyptian slave belonging to the Amalekites, who leads him to the Amalekite camp. David's forces attack the Amalekites and succeed in freeing the captives, including David's wives. He kills all of the Amalekites except for 400 young men who get away on camels. Back in Ziklag, David receives news of Saul's death from an Amalekite man who claims to have slain the king at Saul's own request while the king was in his death throes after the Battle of Gilboa. David immediately has the man executed. (2 Samuel 1) In 2 Samuel 8, Amalekites are listed among those people subdued by David and whose sacred articles he dedicated to God. 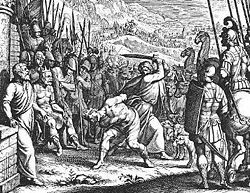 It is further reported that David killed 18,000 Edomites in the Valley of Salt, although it is not specified if these included Amalekites. 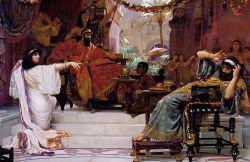 Haman, the villain of the Book of Esther, was an "Agagite," supposedly descended from Amalekite kings. In Jewish tradition, the Amalekites came to represent the archetypal enemy of the Jews. For example, Haman, the murderous villain of the Book of Esther, is called the "Agagite," which is interpreted as being a descendant of the Amalekite king Agag. Of the 613 mitzvot (commandments) followed by Orthodox Jews, three refer to the Amalekites: to remember what the Amalekites did to the Jews, to remember what the Amalekites did to the Israelites in the wilderness, and to destroy the Amalekites utterly. "He betook himself to slay the women and the children, and thought he did not act therein either barbarously or inhumanly; first, because they were enemies whom he thus treated, and, in the next place, because it was done by the command of God, whom it was dangerous not to obey" (Flavius Josephus, Antiquites Judicae, Book VI, Chapter 7). The great medieval sage Maimonides, however, explained that the commandment to destroy the nation of Amalek is by no means absolute. Indeed, according to the Deuteronomic precepts, before fighting, it is required that the Israelites peacefully request of them to accept the Noachide laws and pay a tax to the Jewish kingdom. Only if they refuse is the commandment applicable. The origins and identity of the Amalekites remain a subject of discussion, and the ethics of their treatment by the Israelites are a topic of contentious debate. No archaeological evidence of the Amalekites exists that can be distinguished from their Edomite and other semitic counterparts. It is thus impossible to identify them historically outside of the biblical record, which is written by their mortal enemies, the very people who claim to have exterminated them at God's command. The Bible itself gives contradictory accounts of their origins. Genesis 14 describes them as present already in Abraham's time, while the prophet Balaam calls them as "the first of the nations." Genesis 36 contradicts this by portraying them as an Edomite clan descended from Esau's son Eliphaz, by his concubine Tinma. That they operated in the territory of the Edomites and also in the hill country east of the Jordan River seems clear, although their reported presence at Rephidim puts them farther south in the Sinai peninsula. This is certainly plausible if they, like other semitic tribes, were nomadic. The report of Amalekites existing in Abraham's time, meanwhile, is seen as evidence that the Book of Genesis consists of multiple sources which do not always agree with each other, for they could not have been so ancient if they were descendant from Esau's grandson. Being a tribe of the Edomites would make the Amalekites immune from destruction by the Israelites, since God commanded the Israelites to treat the Edomites as brothers (Deuteronomy 23:7). The biblical writers may have used the unprovoked attack by the Amalekites against the Israelites during the Exodus to supersede this injunction, making the Amalekites a special case—reprobate Edomites not to be treated as brothers, but singled out by God Himself for extermination. The commandment of God to destroy the Amalekites seems to be a clear case of biblically-endorsed genocide that has troubled commentators from time in memoriam. The fact that the Amalekites had attacked the Israelites during the Exodus seems inadequate grounds to justify such a drastic policy. Supporters of the doctrine of biblical inerrancy argue that since God is good and the Bible says that God commanded the extermination of the Amalekites, then actions toward that end—even the killing of women and children—must be good in this case. Indeed, the slaughter of the Amalekites was such a moral imperative that Saul's failure to fulfill the order completely is said to have disqualified him from the kingship. Arguing against this, biblical critics claim that histories such as those in the Bible are written "by the winners," who are free to make whatever claims they wish to about God's supposed will, since they victims cannot answer them. Such critics argue that by any objective standard, the actions of military leaders such as Saul and David toward the Amalekites must be judged as war crimes of the first order. ↑ Jericho here is referred to as the City of Palms. The passage seems to contradict the Book of Joshua and later claims that the city remained in ruins. ↑ David is fortunate that the Amalekites do not kill all of the town's inhabitants, as David and Saul reportedly both did to Amalekite towns. ↑ Yoseph Carmel. Itzchak Ben Zvi from his Diary in the President's office. (Mesada: Ramat Gan, 1967), 179. Sagi, Avi. "The Punishment of Amalek in Jewish Tradition: Coping with the Moral Problem." Harvard Theological Review 87(3) (1994): 323-346. Amalek, Based on the teachings of the Lubavitcher Rebbe. www.chabad.org. This page was last modified on 14 March 2019, at 15:54.